5.0 1 Review This action will navigate to reviews. Your estimated delivery time will be 2 business days from the time of Order. Make perfect espressos, cappuccinos, caffe lattes and other milk drinks at the touch of a button. The intuitive soft touch control panel with backlit icons enables you to personalise your coffee by selecting short, medium or long and the correct temperature. The long coffee option, perfect for drip coffee lovers, delivers a delicate flavour that can be enjoyed at any time of day. The advanced milk frother with adjustable froth switch creates a silky smooth milk foam to create your favourite milk beverages including cappuccino, caffe latte, latte macchiato or hot water for tea or infusions. Is this in-store only? Shows as £469.99 on the link. Seems expensive. I bought the next model down for almost £200 less at the same time last year. Offer starts Friday I think, looking at the snapshot. How many machines have you got ? 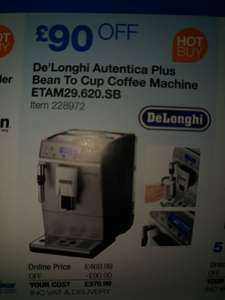 Costco have stopped selling Delonghi machines for some reason?